The Kosher Korner Kafe has long been a landmark in both New York gourmet and Civil Rights circles. First founded after the civil war, in 1866 it was a rallying point for Jewish and Black leaders of the time to discuss issues relating to post-war oppression. The Kafe was burned in 1869 by racist/fascist/Nazi/otherwise bad people. The Kafe was re-opened by some brothers in 1915 under black management, disguising themselves by instituting the now famous white uniforms, so that Jewish customers would continue to frequent the restaurant. The Kafe became so popular that branches were opened all over the United Spades of Amerika. The Kafe was known during this period as being very anti-immigrant, and was even called racist, a charge the owners, being African American, laughed off. The charges, however, became more serious as churches, offended by the burning cross logo of the Kafe, began to campaign against them. Southern black groups also joined the fray, claiming a growing that their Franchises were being taken away, and that the central organization was requiring "literacy tests" before granting a franchise, ostensibly to prevent incompetent stores from opening. The Southern blacks, feeling disenfranchised, repeatedly confronted restaurant workers. Sometimes, the confrontations even got violent. 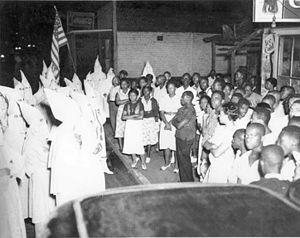 Today, the KKK is a much smaller organization, having passed its glorious heydays in the 1920's and 1930's. Each cafe was supposed to be run by a Grand Dragon. Unfortunatelyapin the dragon labour market in 1911 meant that policy had to be reassessed. In addition, the mismanagement of Coco the Dragon at the Kafe in Flagstaff, Arizona meant that 34 people were admitted to General Hospital 3 with 2nd degree burns. Soon after, National President Grand Dang Diggy Dragon Bruce Springsteen issued the "Edict of 1830" in response to the crisis. No one knows why he issued the edict for the wrong year, or why it was written on the back of damp cocktail napkin, but it was followed to the T. 6 year later, then KKK was run by a strict hierarchical system of genetically engineered toucans, and stock prices soared. In 1920, a commission headed up by Harlan Fiske Stone was established to investigate allegations that the organization was using slave labour to man the pizza ovens. This eventually led to the case KKK vs. The United States where a 9-0 decision overturned the allegations, claiming that slavery was acceptable under the 3rd amendment. The Krispy Kreme Klub is a group of extremist ice-cream worshippers. Nothing is known about them but the fact that they worship someone named Ugmar. --- Midnight, Oct 30, 2005, new information has been found on Ugmar. He is an obscure Norse god of chickens and his earthly form is some high priest named Vedran. Our researchers are still working on it. Results expected sometime before 2008, but not before Hanukkah 2015. Hang in there! The Kekeke is used extensively in games of Starcraft, ensuring victory over unwitting opponents. Wal-Mart founder John Walton, and former secretary of Gay Supercowboy Alliance organizer Ponce de Leon, was the 16th Grand Dragon of the KKK?